There is a choice of 3 ways to attend the course: The first 2 days are aimed to give an introduction to the fundamental knowledge and skills necessary for the performance of SEPs, MEPs and EMG monitoring in theatre. 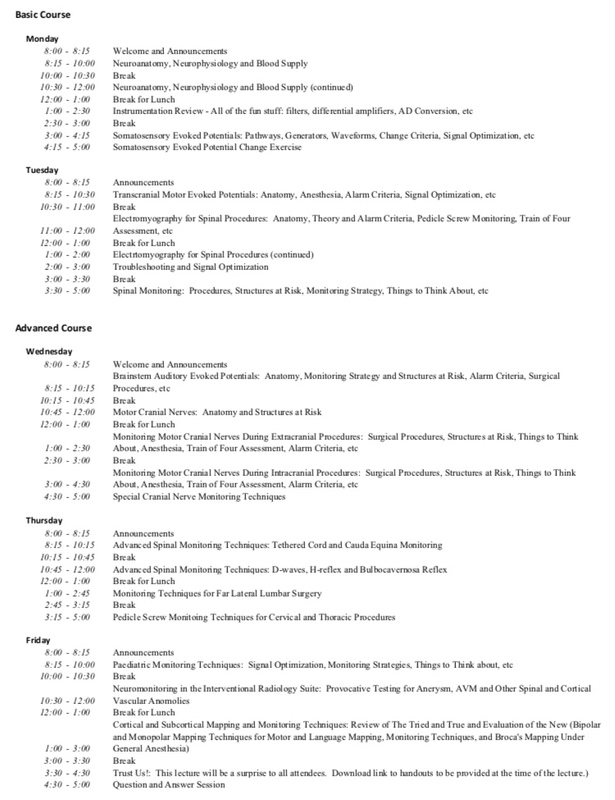 The following 3 days provides an introduction to the advanced concepts of BAEP’s, Motor Cranial Nerve Monitoring, D-waves, H-reflex and BCR, Pedicle Screw Monitoring, Cortical and Subcortical Mapping and Monitoring and special spinal monitoring considerations for Far Lateral Lumbar Surgery. It is possible to attend either, the first two days, the last three days or the whole week. Registration will be from 08:00 for a 08:15 start and is scheduled to end at 17:00 each day. The meeting will include a light lunch and tea/coffee breaks. Places are restricted to 30 delegates so please submit your registration form and payment as soon as possible – existing NMUK members will get priority for course places until 25th February 2018 after which it is first come first served! *For the subscriber rate to be applicable you must be a subscriber to NM UK the day before 21st January 2018. The prices shown include lunch and refreshments every day during the course and a USB of the course content. The price does not include accommodation. Delegates are personally responsible for fees if the invoice is not paid. 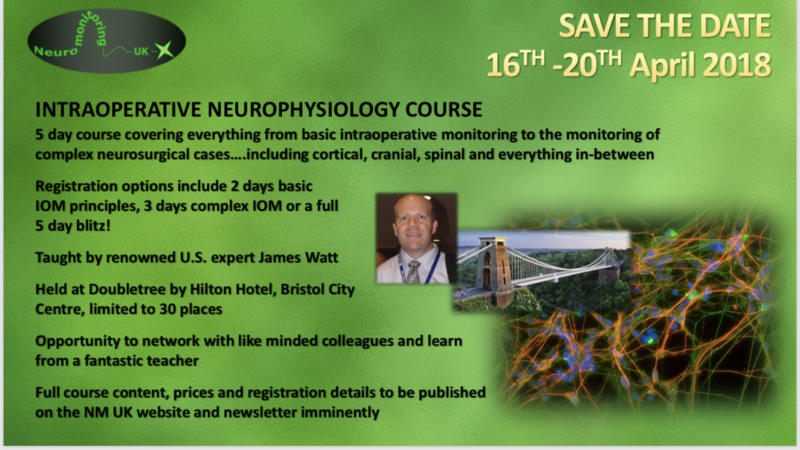 Any notification of withdrawal from the course should be sent at the earliest opportunity to events@neuromonitoringuk.org Refunds will only be made at the discretion of the organising team and no later than 31st March 2018. NM UK reserve the right to cancel the course at any time. Changes to the syllabus may also occur as NM UK representatives work with the James Watt to tailor the course towards the needs of our delegates.